Have you considered using owl baby bedding as the theme for your nursery decor? There are so many cute ideas and products that can be put together to make a unique baby nursery for you little one. When I see these owl themed items it makes me think of wonderful children’s stories that have owls in them. Winnie the Pooh often consults Owl in his stories. There is the Owl and the Pussycat and Good Night Owl. We grew up with stories that usually have a wise old owl in them. So, wouldn’t it be fun to decorate the baby nursery with an owl theme? I have found some fun products that can get you started. Remember the ad campaign from the 1970s with Woodsy Owl telling us to give a Hoot and Don’t Pollute? Maybe he was an inspiration for the owl bedding we have now for decorating a nursery. He is a cute little guy. As I mentioned above, there have been many owls in literature for children. I wonder if any of them inspired the designers to create owl baby bedding and decor items. Do you remember these owls? These are only a few of the owls that I can think of. I bet you have a favorite owl from your childhood. What I love about the set above is that it will work for either gender child. The soft ivory color is a faux fur that will actually help when baby starts to develop some of those motor skills by feeling the difference in the fabric. The set includes 10 pieces so it is quite a bargain. Not only is there a comforter but a blanket, also . 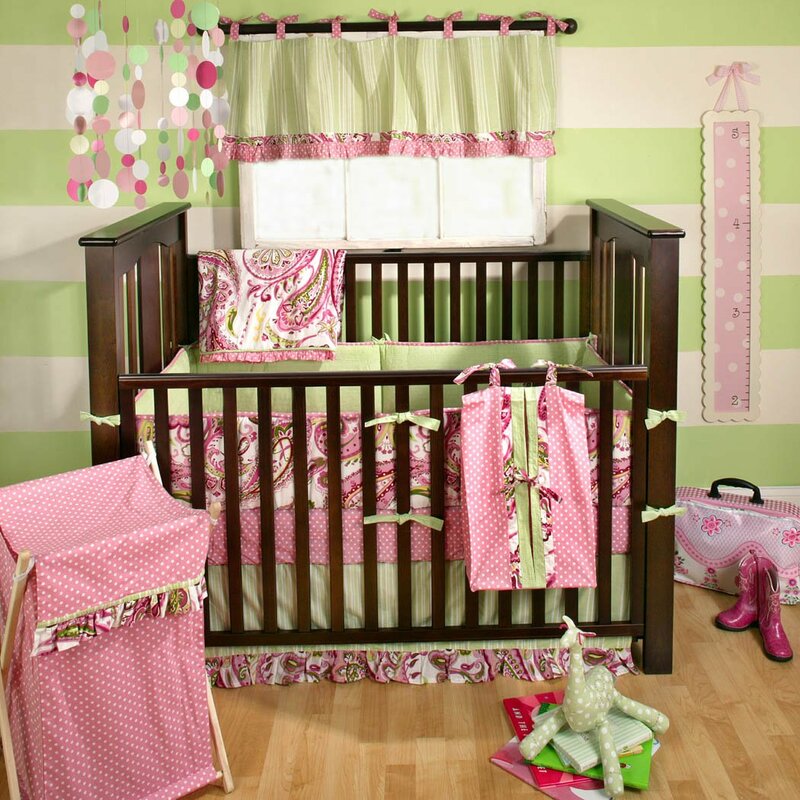 Wall art is included plus 2 crib sheets, dust ruffle, diaper stacker, and a window valance. That is really quite a lot for the money. This turquoise and lime green set is also great for either a boy or a girl. Sweet JoJo Designs has been coming up with creative and unique designs for baby nurseries for quite a while now. 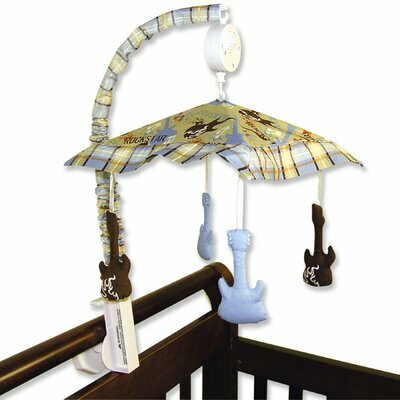 There are also pieces that you can add to enhance the theme of the crib bedding that are not included in the crib set. If you are clever with a sewing machine or you know someone who is, consider getting some cute owl fabric and making your own bedding. You can find coordinating fabrics to make the curtains, valances, and even pillows to complete your decorating theme. I’ve only shown just a couple of examples but with a little searching, I’m sure you will find other owl themed nursery bedding sets if the two that I’ve shown are not exactly what you were looking for. Thanks for stopping by today to see my ideas for owl baby bedding to go in a fun nursery theme. Let me know you were here by leaving a comment or just say “Hoooot”. Farm baby bedding is such an adorable idea for a nursery! Besides our new little bundle of joy, there isn’t anything much cuter than baby farm animals. To combine the two is a fun and unique way to decorate your baby’s room. I believe that most are perfect for a little boy but there are also some bedding sets that work for a little girl, too. There are others that will work for either gender. 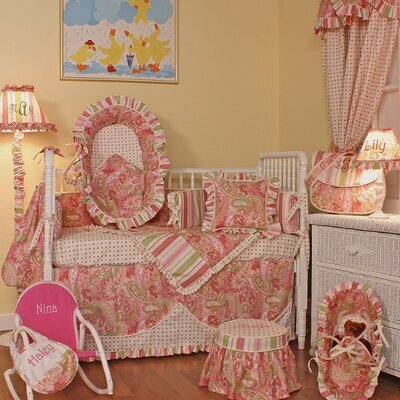 No matter which style you pick you are sure to have fun decorating this special room for your baby. When baby is small, you will be spending quite a deal of time in this room of the house so you might as well make it cute and fun to be in. Let me show you some of the cutest options for farm baby bedding. Another fun idea comes from the makers of toys so you know they know what appeals to kids. The Fisher Price Farm Friends set for crib includes comforter, sheet and bed skirt. Baby cow, piglets, lambs and chicks are the friends from the farm. A matching bumper pad and a mobile that will coordinate nicely are also available for this set. When using this adorable little set to decorate the bed, I would paint the walls of the nursery a pale green and the woodwork white. To make sure that you have a color of green that will blend well, take the comforter to the paint store with you. Hold the paint sample strips next to it to see how they look together. Many stores that sell paint will have the ability to match one of the colors in piece that you take with you with machines that they have in store. Personally, I would not go too dark with the wall color, keep it pale and soothing. And since this little baby bedding set is designed by Fisher-Price who we generally think of for toys, you can add some farm toys in the room too. The barn set comes to my mind immediately! No matter which style of farm baby bedding you choose, this lamp would be so cute in a farm themed nursery. That cute little barn with the animals surrounding it will look pretty awesome no matter which set of bedding you are using. I would not worry too much about the shade on the lamp, it can be switched out easily. You can also cover the lamp shade with a different fabric if the brown plaid is not going to work with the rest of the colors and patterns. Although, I think it is really cute and gives a bit of a rustic look. 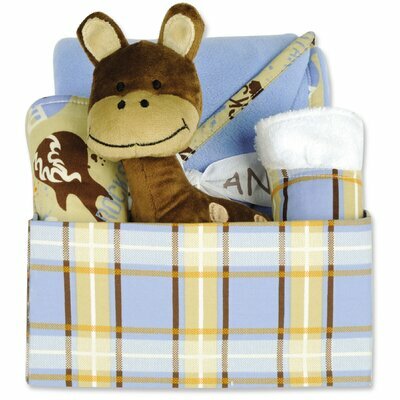 Set includes a quilt, sheet, bed skirt and bumper pad and is called Baby Barnyard by Trend Lab. I absolutely adore the plaid fabric that borders this set! The colors of sage, blues, barn reds and yellows will be very easy to work with when it comes to choosing the paint color for the walls and woodwork in the room. The use of the different fabrics used behind each barnyard animal adds interest to the overall look, too. You can pick a unique baby room decor for your baby’s nursery. A Western nursery theme is fun, different, and easily achieved. 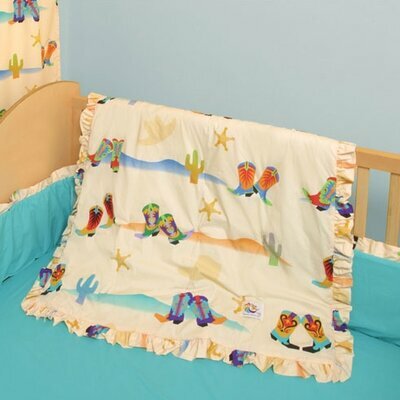 There are several options for western baby bedding for any little cowboy or cowgirl. There are different crib sets with western bedding choices along with decorative pieces to add to make your baby room decor fit your inner cowboy. Lamps, changing tables, and other western accessories are easily found to create a look that fits a home decorated in the Western theme or just for something different and a little out of the ordinary. 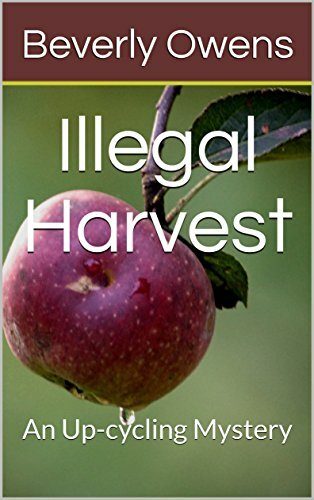 I have selected a few items to showcase to help you create your own western nursery. A nice bargain with the set including thirteen pieces instead of the standard four. Nice little western and pink items for the baby girl’s nursery. 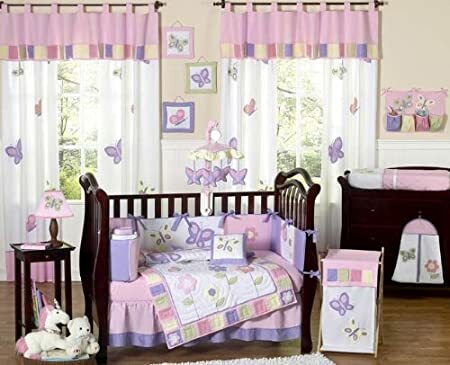 Set includes a comforter, a fitted sheet, crib bumper, crib skirt, two valances, toy bag, diaper stacker, two pillows, and three wall art decor items. What I like about the western nursery choice is that you can choose items that fit both genders of baby. Yes, there are pink accessories perfect for that future little cowgirl. And you will find a nice selection of items for that little guy to dream of roping and riding when he is all grown up. You do not have to restrict yourself to normal baby items as you plan for the future of the room. 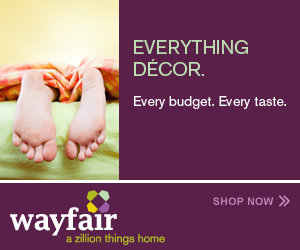 With any theme for a room, the accessories you choose will enhance the room. With a Western baby nursery as your guide you can pick items that are meant for a nursery or you can pick other items that go with the theme. You do not have to go with the baby lamp, but can choose a lamp like the one at right that will grow with baby. Fabrics can be chosen from your local fabric shop to make curtains or you can choose a pair that matches your western nursery bedding. There are really no wrong choices as you decorate your nursery to make it uniquely you for your baby. There are more than a few ways to decorate a nursery in a western theme for your little buckaroo no matter the gender. Below you will see two more ideas for your nursery decorating needs. This calendar for 2014 would be fun hanging on the nursery room wall. I would suggest near the crib or the changing table so that Mom, Dad, or Nanny can keep track of important appointments for baby. You know, doctor appointments, play dates, or any important date involving baby. Adorable little cowboys and cowgirls in training are sure to put a smile on your face! 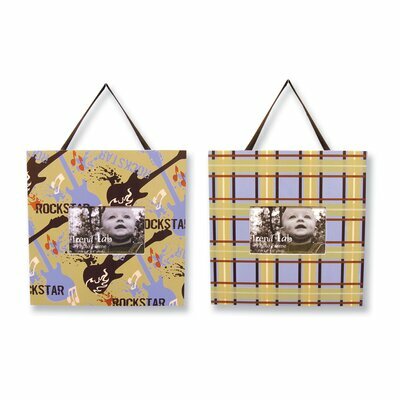 So, have some fun decorating your nursery with a western baby theme! There are just all sorts of ways to go with it.